I was looking for something to make with raagi when my mother gave me a recipe. She'd seen it on a tv cooking show. I took the main ingredients of this recipe & added a lot of other stuff to it to make it mine. With no further ado, here's the recipe. I was in a hurry when I made this dish, so I used store-bought ginger, garlic & tamarind (not tamaring concentrate) pastes. Soak blackeye beans for about 30 mins. Wash & drain water. Microwave (loosely covered) with a few spoons of water for 3-5 minutes. Drain water & keep aside. The beans should be partially cooked, not too soft or too hard. 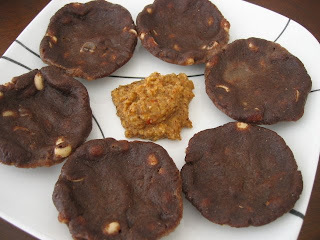 Mix raagi flour, tamarind, ginger & garlic pastes, green chili, jaggery and salt in a mixing bowl. Heat some water - not very hot, just bearable hot. Add water as required to the raagi mixture and knead into a smooth dough. Add cooked blackeye beans. Knead well. Pat into discs and steam for 8 -10 minutes. I used my idli plates to make these patties. The blackeye beans were a little hard and that gave a nice texture. Microwaves vary, so cook the beans for as long or as less as needed - they shouldn't be fully cooked, as they cook further while steaming. There are at least 2 whole grains events going on right now in foodie blogosphere. Sending this dish off to both. 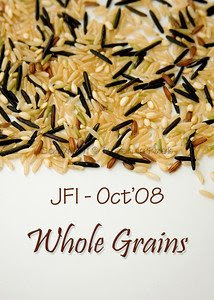 Suganya of Tasty Palettes is hosting JFI - Whole Grains. Aparna of My Diverse Kitchen is hosting WBB - Grains in my Breakfast, an event originally started by Nandita of Saffron Trail. Thank you for sending these adais with a twist to WBB.